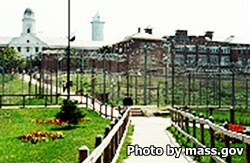 North Central Correctional Institution, NCCI for short, is located in Gardner Massachusetts. This prison was originally established for and built by mentally disturbed inmates in 1902, and has since undergone many changes over the past century, including being closed in the 1970's and then reopened in the 1980's. The prison itself is comprised of eighteen buildings surrounded by razor wire fences, three guard towers, and canine patrol units. NCCI houses medium and minimum custody inmates..
North Central Correctional Institution has programs that give inmates academic and vocational educations. A program at this facility called NEADS allow inmates to work with dogs, training them as service canines that are used all over the United States. Inmates are allowed five visits per week that occur on Mondays 1pm-8:30pm, Fridays 1pm-8:30pm, and Saturdays from 1pm-5pm (A-L) and Saturdays 5pm-8:30pm (L-Z), Sundays from 1pm-5pm (M-Z) and Sundays 5pm-8:30pm (A-L). There are no visits on Tuesdays and Wednesdays. A maximum of two adults can visit at a time, there is no limitation on the number of children allowed. Visits are one hour in duration. You may arrive on institutional grounds no earlier than 12:30pm.